Such is the life of John Hasard, P.I. 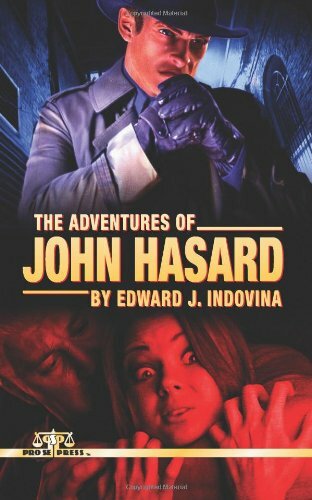 in THE ADVENTURES OF JOHN HASARD by Edward J. Indovina, the latest release from cutting edge Genre Fiction and New Pulp Publisher Pro Se Productions. In THE ADVENTURES OF JOHN HASARD, Hasard wasn't always a loner. He was made that way due to the loss of his wife, partner, and pretty much everyone else that he ever got close to. Was he bad luck or was he just getting what he deserved? But, Hasard isn’t alone. Whether it's a sassy cab driver, an arrogant professor, a condescending secretary, or a surly bartender, John's world is full of people who care about him and want to help regardless if he wants it or not. The stories of John Hasard are a throwback to classic Pulp detective stories. Nasty men, beautiful dames, and eccentric sidekicks people the city and the stories that Hasard lives within. So, pour yourself a drink on the rocks, tilt your fedora, light one if you got it and perch yourself on the edge of your seat for a classic PI type two fisted read. Artist Jeff Hayes delivers a two fisted intense cover and David J. Foster provides evocative cover design and print formatting for THE ADVENTURES OF JOHN HASARD. The book is now available at Amazon and at Pro Se’s own store at http://tinyurl.com/qb4db3o for $9.00. The novel will be available in a matter of days as an Ebook on Amazon, Barnes and Noble, and Smashwords.